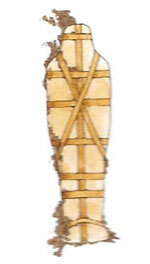 Learn all about ancient Egyptian mummification. Know interesting facts about how the ancient Egyptians made mummies. First, let’s know a little about where these mummies were found and what were the other precious things found with the mummies. Why did Ancient Egyptians make tombs to look like houses? Because they believed that they would continue to live when they had died. What can we see inside Ancient Egyptian tombs? Following are a list of the things found by the archaeologist, Howard Carter in king Tutankhamen’s tomb, in 1922. This is Tutankhamen’s death mask. 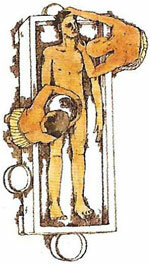 It is decorated with the head of a bird and the head of a snake. 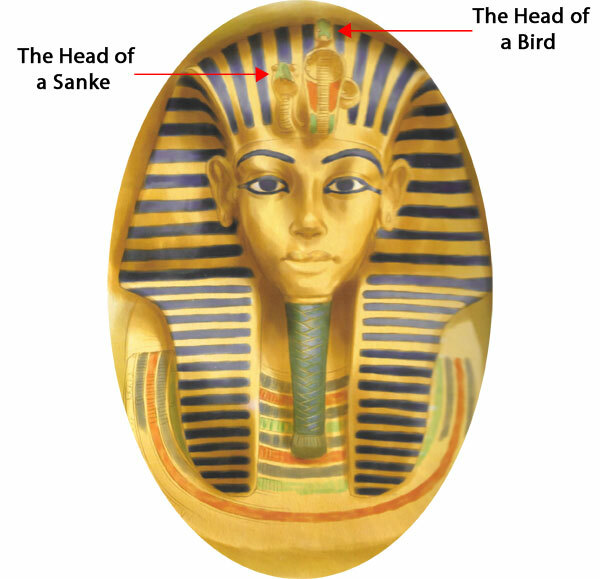 The bird’s head represents southern Egypt whereas the snake’s head represents the northern Egypt. This means that Tutankhamen ruled the whole of Egypt. How to make a mummy? What is meant by mummification? To treat a dead body with a preservative substance (chemical addition) in order to stop it decaying is called mummification. What is the way used nowadays to preserve dead bodies which is similar to mummifying? Why did Ancient Egyptians mummify dead bodies? Ancient Egyptians mummified dead bodies because they believed that when a person died, his or her soul would need to use the body again. Step 1 Parts of the insides of the dead body were taken out. Step 2 Body was filled with spices and pickled for 70 days. Step 3 Body was washed. Step 4 Body was wrapped from head to foot in linen cut into strips. 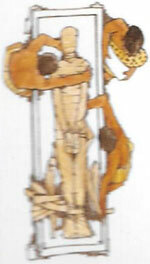 Step 5 Body was put inside a wooden case made in the shape of human being. Step 6 The wooden case was sealed. Step 7 Wooden case was stood up against the wall and stored in a burial chamber. Who recorded about the Ancient Egyptian mummifying technique (method/ system)? 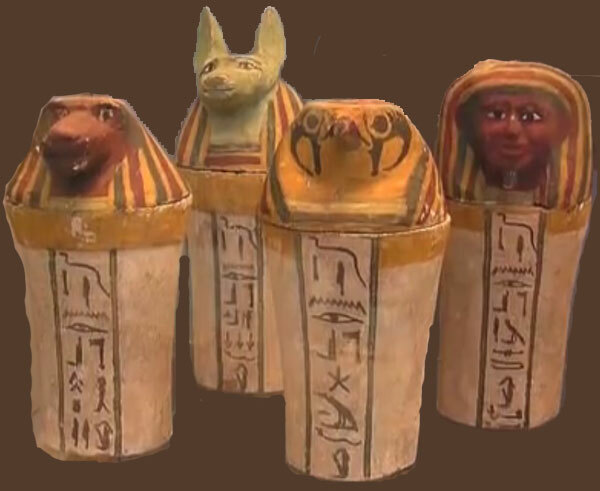 1) Special jars which Ancient Egyptians used to store the parts taken out of a dead body were called canopic jars. 2) Canopic jars were buried with the person. Who arranged for their dead bodies to be mummified cheaply? Who else were mummified in Ancient Egypt? 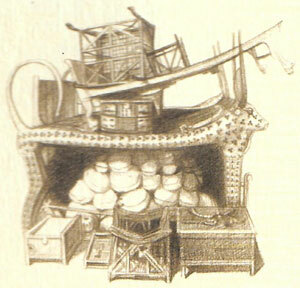 How were Ancient Egyptian coffins decorated? 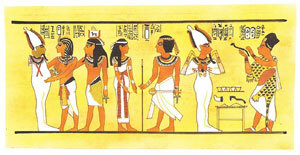 Many Ancient Egyptian coffins were decorated with pictures and hieroglyphics. 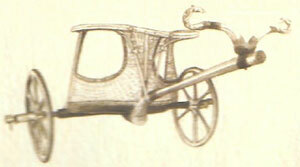 Nakht was a weaver who worked for one of the pharaohs in Ancient Egypt. How do we know that Nakht was a weaver of a pharaoh? The hieroglyphs on his coffin tell us that he was a weaver of a pharaoh. What did the modern doctors discovered after unwrapping the mummy of Nakht? 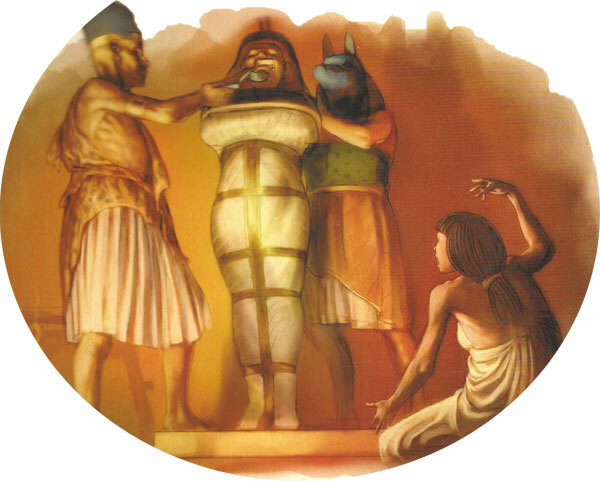 They discovered that the mummy had not been pickled and Nakht’s insides were still in the body. About the weaver Nakht who lived in Ancient Egypt, according to the things found out by modern doctors. 1) Nakht was about 16 years when he died. 2) Modern doctors have found out that he might have breathed in dust and sand while working in a stone quarry. 3) He contained parasites, including a tape worm, and suffered from malnutrition. Organisms living on another organism and harm it. 1) It is a flatworm with a long ribbon-shaped segmented (divided into parts) body that lives in the gut of vertebrate animals like domestic animals (pigs) and humans. 2) Humans can get infected, especially by eating uncooked meat containing tapeworm larvae. What is meant by ‘malnutrition’? 1) Being unhealthy and having physical harm due to lack of nutrients in the diet, or having too much of unhealthy foods is called malnutrition. 2) Malnutrition can be caused by parasites like tapeworm.